Incorporated in 1872, the residents of the Town of Island Falls consist of hard working, conscientious people who pride themselves in ensuring visitors from all parts of the country feel welcome and return year after year. The town of Island Falls is located in Southern Aroostook, directly off I-95. Our town is 13 miles square, with a population of 753. The town is a Town Meeting/Selectboard/Town Manager form of government. Our annual Town Meeting is held the second Monday of March. Regular Selectmen's meetings are held every other Wednesday at 6:00 p.m.
ISLAND FALLS IS A FOUR SEASON TOWN WITH ATTRACTIONS FOR ALL SEASONS. Looking for an all season vacation wonderland off the beaten path? No matter what time of year you choose to visit, Island Falls is a small community experience filled with breathtaking scenery, sporting adventure, pristine lakes and ponds, and fine dining. Island Falls offers a four-season experience, is located right off I-95, is a winter wonderland of tranquility where families come to enjoy some of the finest ITS snowmobile trails, and trail conditions of the terrain are a welcome addition to the enjoyment of the sport. The ITS connects the local snowmobile club as well as lodging and dining establishments. Spring brings the wildflowers in bloom, the trees budding, and the wildlife on the move. Days become longer and temperatures warmer inviting outdoor enthusiasts to take in some fishing, take a tour of the local historical society, visit the library, shop for a craft, have lunch with a friend old or new, enjoy a scenic walk or revel in the ability to be out in the fresh, clean air. Summer is a great time for canoeing, kayaking, fishing, and boating on our 2 large lakes or numerous small ponds and rivers, visit a vast array of historical sites, grab your clubs and enjoy a day on our 18-hole golf course that attracts golfers from all areas. Fall is a wonderful time to enjoy the same summer activities in slightly cooler temperatures. The breathtaking beauty of the foliage viewed in crisp cooler air makes this a favorite season for many. With vast woods surrounding the town, wildlife abounds and the deer and moose season catches the attention of all. Local guide services can assist in planning, outfitting and guiding you on your hunting experience. We invite you to come and see why vacationers come from all parts of the country to visit year after year. Town office hours are Monday-Friday, 8:00 a.m. to 4:00 p.m.
Selectmen's meetings are held every other Wednesday at 6:00 p.m. In the summer of 1841, Levi Sewall, Neamiah Alexander and Jesse Craig came to Northern Maine looking for a promising place to build a home. Mr Sewall had made the acquaintance of Mr. Jonas Drury, who told him of a beautiful place he had seen while traveling from Patten to Houlton along the West Branch of the Mattawamkeag River. There he had found an island and fall which he believed had the possibility of furnishing a good source of water-power. The three men located the island and the fall and, after looking over the surrounding territory, decided there, indeed, was an excellent place to build a home. 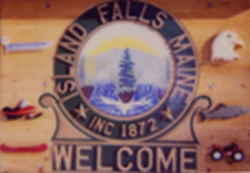 Mr Sewalls home was the first one to be built in Island Falls. Both Mr. Sewall and Mr. Craig took active parts in the development of Island Falls as important officials of the growing community. Starting in 1852, the population of Island Falls grew by leaps and bounds, and as it grew, the need for public facilities and services also grew. The first public schoolhouse was built in 1859. The log building served as a church and regular meeting house, as well as for class work. This school was replaced in 1875 by a larger frame building. The first high school was built in 1897. In 1901, it burned down and was replaced in 1902. This new building served the community until 1973, when a consolidated school in Dyer Brook took it's place, which now serves several surrounding towns. Before any churches were built in Island Falls, religious meetings were held in various homes in the community. In 1859, the Congregational Church was organized, but the church was not constructed until 1894. On February 12, 1860, the Island Falls School was presented with a library, which was a gift from the Hammond Street Church in Bangor. Shortly after that, some bookcases were donated by Mr. Albian Merriman and the library was organized. The Island Falls Post Office was established in 1863. Mail delivery was once a week and was brought over from Patten. The first post office was located in the original Sewall homestead, and was later moved to the Sewall's frame house residence. The old mail slot can still be seen in the kitchen door. Island Falls remained a small settlement until about 1892, although ten years earlier, it had incorporated and the name Island Falls became official. At that time, the population was only 183 people. The first Town Meeting was held on March 13, 1872, when officers were elected. The William W. Sewall homestead was the first building to become a historical site in Island Falls. William Sewell was a lifelong friend of Theodore Roosevelt. Mr. Roosevelt visited the Sewell's many times and spent time in both the Sewell's house and their hunting camp on Mattawamkeag Lake. There is a state park dedicated to President Roosevelt along the Mattawamkeag River below the lake where he went to read his bible on Sundays. It is called Bible Point and remains a lovely place to visit. Pettengill's Hall, which is also called the Island Falls Opera House, is also one of the Town's historic sites. This building was the center of the Town's entertainment activities. It has been closed for many years, but was once filled with the town's people, who enjoyed the movies, and traveling entertainment. Moving pictures were shown in Pettengill's Hall from 1910 to 1965. The old movie projector is still there with several films which were the last to be shown.